Sorry for not posting for almost three weeks, but the night after I took Spring to the airport after her retreat (which was GREAT, by the way) I ended up in the Emergency Room (with what I thought was a detached retina, but which turned out to be nothing serious — thank goodness!) and then right after that I had to catch a train to Kansas City to attend my niece’s (FABULOUS) wedding, and meanwhile there was all the post-retreat business I didn’t get done because I was dealing with all the other stuff, and then my back started seizing up, and then I had pre-Thanksgiving grocery shopping that needed to get done….. And so well anyway, that’s how it’s been. 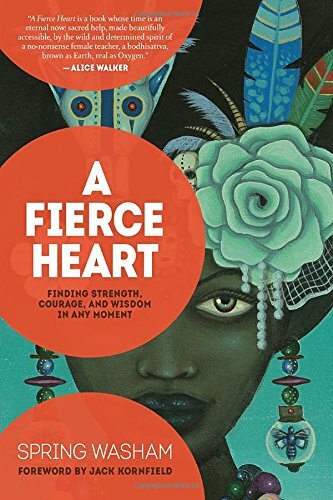 On the plus side however, while I was stretching out my back, I was able to read Spring Washam’s new book, A Fierce Heart: Finding Strength, Courage, and Wisdom in Any Moment. Which I HIGHLY recommend. “Amidst uncertain times, we need strong and inspiring medicine. In A Fierce Heart, you will find this medicine: beautiful teachings and heartfelt stories that can transform your day and change your life. The real purpose of these stores is to awaken and empower you. They will remind you of profound possibilities and provide a sweet, healing balm of wisdom and love for your own difficult and joyful journey. “What is the calling of your own heart? “How fully are you living your own life, this day, this year? “How free is your spirit, how wide is your compassion? “If you were to be more spiritually adventurous, what would that mean? “Have you considered meditation? Would more if it be good for you? “How about shamanic practice, or sacred medicine? Do you find a calling to it? “Are you called to work for justice, to combine it with spiritual courage? “…Amidst the 10,000 joys and sorrows of your human incarnation, at this time of both miraculous outer development and widespread injustice, all your courage and wisdom and compassion are needed. “Let Spring’s stories touch you and enliven you. “And then, follow their inspiration. “Let them lead you on your own miraculous journey.